These examples request the status of the metadata server and show the arguments that can connect to the metadata server. They compare the default output to the output that can be obtained with the OUT= argument. Specify connection arguments and query the metadata server for its status. This example specifies all connection arguments for the metadata server and show the output that is written to the SAS log. 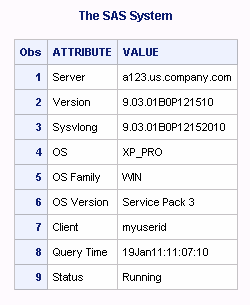 NOTE: Server a123.us.company.com Client is myuserid. Specify connection arguments, query the metadata server for its status, and specify the OUT= argument. LOCALHOST specifies the metadata server that is running on the same host as the SAS session. The status output is written to a data set named WORK.STATOUT.